This past week, we’ve had the joy of having very few activities on our family calendar. As such, we’ve been able to finish school and chores rather quickly so as to have more time for what I like to call “family development.” You know, the stuff that really builds a family unit–like biking to the park together, playing tag in the backyard–that sort of thing. This time has also got me thinking more about what my kids will remember me most for when I’m gone. I hope they have positive memories of our times together, but even more I want to leave a legacy, a godly legacy, that will last not only through the time of my children but my grandchildren and beyond. I also want my children to know beyond a shadow of doubt that they are loved and will continue to be loved no matter what. If your goals are anything like mine, then creating cherish-able moments and items can become priceless. As such, I want to share with you 8 things we can do today that our children will most likely cherish for the rest of their lives. Eat together. You may choose to eat together at supper, lunch, or breakfast or all the above. It doesn’t matter WHEN you do it, as long as THAT you do it. I recently read about a family that could rarely find the time to eat supper together with all their after school activities. So, they made breakfast a BIG deal. Everyone sat together and cooked together and got up early to enjoy that time together. It’s not WHEN you do it; it’s THAT you do it that counts. Go on a special outing together. If you think back on your childhood, probably some of the most memorable events are those that took place on vacations or special outings. This is because it is a special length of time that only happened once, thereby earning a special place in your brain that you will less likely forget. Some of my favorite memories include eating at a fancy restaurant in Washington D.C., feeding the seagulls outside our hotel room on the gulf of Corpus Cristi, and hiking in the mountains near Glorieta. Spend time with them. If they are young, put the computer work and social media aside at least 30 minutes a day and play with them. If they are older, go on parent/child dates, exercise together, or at the very least get involved in their school activities or sports. Show that you care by your actions. I will never forget my daddy cheering me on from the basketball sidelines or riding horses with me after school, or my mom playing games with my on my bedroom floor as I sat with a 100 degree temperature. It’s those special moments I cherish most. Look at them in the eye when they talk to you. Get down on their level. Let them know you are really listening and care. Otherwise, they know you are only half-listening and will probably forget what they are saying within the minute. Just like you want to know they are listening when you speak, they want to know they are being listened to also. Pray for them and with them. As a rule, we pray together at meals and on occasion during our homeschool Bible time, but my favorite time to pray with the girls is bedtime because we thank God not only for the day, but pray for our actions, our needs, and so many of those other things that just get tossed aside in an “I’m hungry. Let’s eat” kind of prayer. Have a time where you pray your heart for them and with them. Let them see you pray for them too. Let them know that even you need God’s help in raising them and in everyday life. From your example they will learn that it’s important to trust God with everything. Tell them you love them and God loves them too. 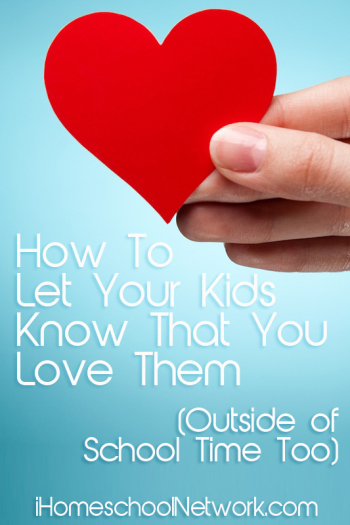 Oh how my heart breaks every time I read a story about a child who didn’t think their parents ever loved them because they never said the words, “I love you.” As such, I’m often telling my kids, “I will always love you…no…matter…what…and God will too.” We are the first and strongest example of Christ’s love our children will ever see. Let’s make it a good one. Oh, and don’t forget the hug. That child with the love language of touch will never forget your hugs either. What other things do you do that you hope your children will cherish for the rest of their lives? This is a great list and so true. This is a great list! So very true! Every year I make a book – When you were eight, when you were nine, when you were ten, etc. and we love looking through these together. Also, we pray together every day and this is my favorite time of the day. It does bring you closer and it really is time they will always remember. Thank you so much for posting! I do photo albums for every year too but I never thought about calling it “when you were…” such a cute idea! I may steal it. 😉 Ca-ute! I love this list! A great reminder of what is important! Thank you for sharing on the Art of Home-Making Mondays! Awesome! That’s great! Thanks Coppelia. Me too! I love that you included laugh with them. I think it is one of the most important things we can do with our kiddos. Great post! Thanks Cheryl. I totally agree! Sometimes I still don’t think I do it enough. Love, love these 8 things. Simple things with with lasting impressions and creating forever memories! Saying hello from the Saturday soiree blog party and I am so glad that I did as today is our family day and these serve as great reminders! Beautiful post!! Stopping by from The Ultimate Pinterest party! Oh yea! Hi from SSBP. Thank you for stopping by. So glad God used this post to minister to you. Have a fun family day! Me too. It’s the silly things that are sometimes the most fun for us adults too. Ha! Thanks for stopping by Jennifer! Thanks for stopping by Susen, and thanks for the compliment. It was a fun post to write for sure. Great tips! I love how easy they are to do, and yet they make a huge difference! Thanks for sharing on Equipping Godly Women Fellowship Fridays! So true! Thanks for hosting and hopping over! Love this. All of these are so important. I really appreciate this post. Thank you! So sweet. Yep, Peanut still asks to be made into a peanut butter sandwich right before she falls alseep. Funny how the little things we start when they are little stick with them. Thanks for sharing!